One of the hazards of writing an academic article that garners a substantial amount of media attention is that it will often attract critics of widely inconsistent quality. While some of this criticism can be healthy and foster productive discussions, a fair amount of it tends toward the “grasping at straws” variety. Earlier this evening Brad DeLong re-posted one such challenge to my forthcoming article, with Robert Murphy, in which we take apart Thomas Piketty’s empirical contributions. 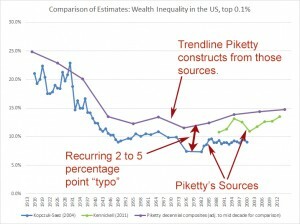 One of our primary conclusions in the article is that Piketty exhibits a tendency to cherry-pick his sources and massage his data findings in ways that confirm his prior expectations about the nature of inequality. This is a type of confirmation bias, and it generally indicates that the afflicted work is putting the cart of its own conclusions before the data horse that supposedly sustains those conclusions empirically. 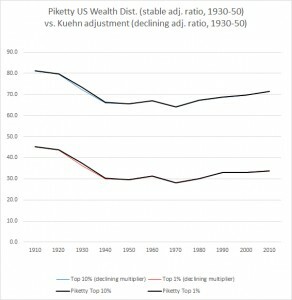 DeLong links to a recent blog post by Daniel Kuehn, which in turn takes issue with our finding of biasing distortions in Piketty’s main chart for inequality in the U.S., Figure 10.5. 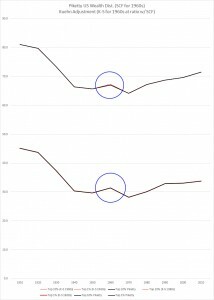 While neither DeLong nor Kuehn seem to dispute the existence of several distortions that we identify in Piketty’s work that end up accentuating his inequality thesis, they do seem to contend that other decisions by Piketty work in the opposite direction – in effect, balancing out some of the biases and giving him a more even-handed approach to the data. 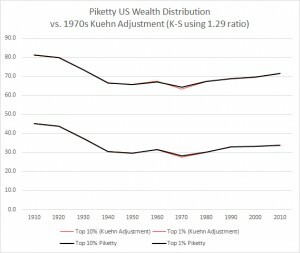 Specifically, Kuehn claims to have identified three examples in the construction of Figure 10.5 where Piketty’s data decisions – we are told – actually “work against his narrative” on the inequality dynamics of the United States. Since our analysis contends that Piketty’s decisions are overwhelmingly one-sided in support of his inequality narrative, these examples – if true – would potentially weaken our case that Piketty’s biases undermine a core part of his empirics. Now Kuehn isn’t exactly the most lucid writer in the economics blogosphere, so it’s sometimes difficult to discern what he is trying to say from his writings. 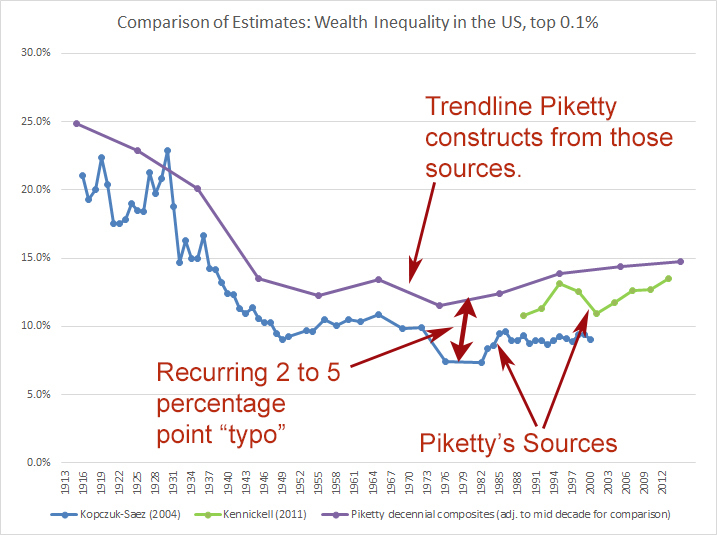 With that caveat in mind and making an honest effort to capture the gist of each point, I put his three purported examples to the test to see if they materially alter Piketty’s figure 10.5 in a way that works against the inequality narrative, as claimed. 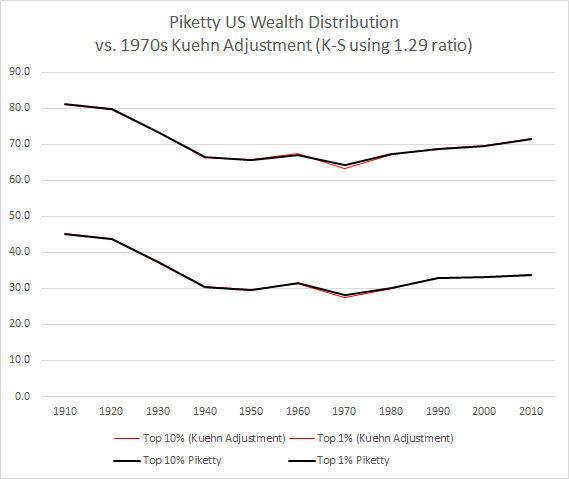 To do this I reconstructed the Piketty trend line by removing the alleged narrative-damaging adjustments that Kuehn identifies and compared the results to Piketty’s unaltered Figure 10.5. To put it mildly, one could say that Kuehn vastly overstates the importance of all three of his examples. 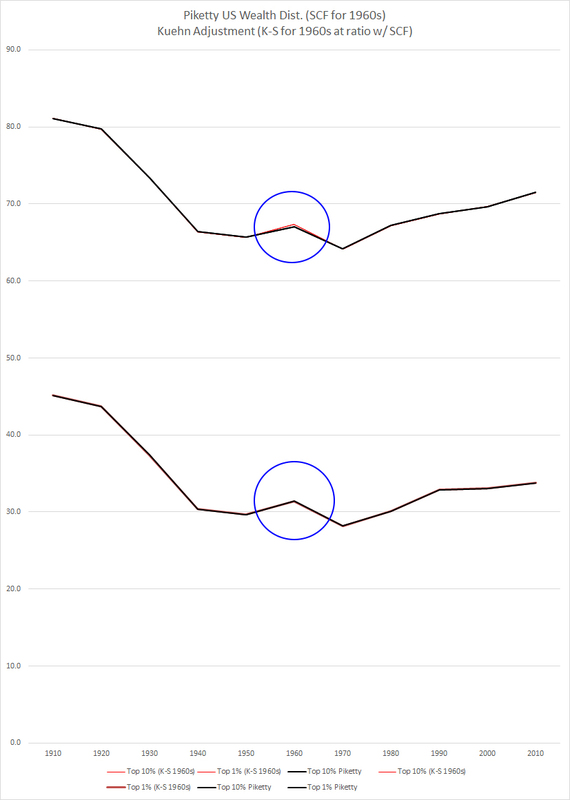 Not only do they fail to substantively alter Piketty’s figure in ways that disrupt or work against his inequality narrative, but they also barely even register any effect upon the shape of that figure. At all. 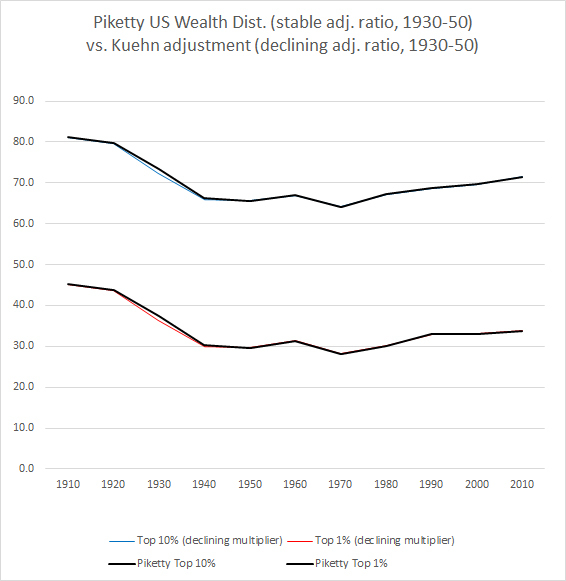 By contrast in all three cases referenced in DeLong’s question and the accompanying blog post, the alleged disadvantage posed by each to Piketty’s narrative is simply nowhere to be found. Indeed, even where it registers it is so small as to be practically imperceptible. Keep straining away at those gnats as you continue to swallow Piketty’s camels though! This entry was posted by Phillip W. Magness on Saturday, January 17th, 2015 at 12:22 am	and is filed under Uncategorized. You can follow any responses to this entry through the RSS 2.0 feed. Both comments and pings are currently closed.